If you’re anything like me, you love a good challenge. When something says “you can’t do this”, I like to roll my sleeves and prove that I can. So when I got into Slime-san Superslime Edition for the first time, I was itching to see what kind of hurdle was ahead of me. 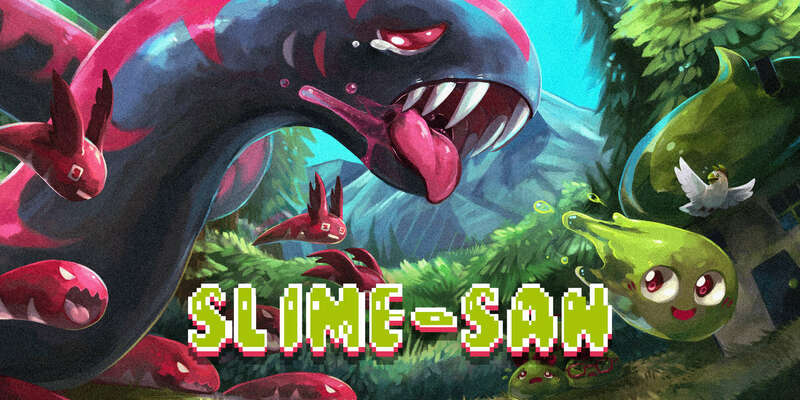 Released just last week, Slime-san Superslime Edition brings back last years addition to the indie platform genre, albeit with some neat new challenges. Before you call it another Super Meat Boy, I should tell you that Slime-san is in a whole different ballpark. While both share similar foundations, Slime-san Superslime Edition adds features to help ease certain growing pains for players who aren’t pixel perfect jumpers. With that in mind, this charming little orb of goo brought all the joys and expected frustration that make for a rock solid title. What do you do when a giant worm swallows you whole and stomach acid swells up behind you? You run like hell! That’s what Slime-san did, with his little bird friend in tow. After finding himself in a city built in the lower bowels of his predator, Slime-san wasted no time leaving. You’ll find yourself learning the ropes as you hop, skip, jump and inevitably perish through each group of levels. Sprinkled into every death maze is one apple that can be used to unlock items, but getting to them can be a challenge. Some apples are in hard to reach areas and often leaves you with mere milliseconds to get back on course. Plus, each level has a time limit. If you take too long, a wall of acid will begin to wash over the screen. The acid is a great feature though. It slides into view and creates some nail biting moments. I found myself shouting at the screen to urge Slime-san to move faster and celebrated every split second finish. Of course, there was even more shouting when I didn’t make it. I really welcomed the idea of the acid coming in though. Instead of plotting out my approach to each level, I had to improvise my moves because I literally didn’t have time to think. Sometimes the method I originally started with took more time than the method I ended up finishing the level with. And that is one of the shining traits of Slime-san. It wasn’t so much about perfecting one single approach. It was about finding your own way to get the job done and maybe fit an apple or two in there. Every level was fair and winnable, but figuring out how to beat it was the key to it all. Plus, the addition of apples gives the game a nice bump in difficulty should players choose to go for them. As for Slime-san, he has a bag of tricks that made for some interesting solutions to each obstacle. If Super Mario could do what Slime-san does on a daily basis, I would have crushed that game instead of my controller. There’s been this trope in platformers that says these types of games have to be hard and unforgiving. If you don’t have the dexterity to play them, you’ll need to either play for dozens more hours or just quit. Not with Slime-san. This little guy has an edge over his opposition with a few abilities that saved me from a serious headache. Slime-san can double jump, dash to cover more ground, stick to walls, and phase through green objects. Dashing momentarily speeds up the movement of obstacles in the level while phasing slows them down for however long you hold the button. Time ticks at the same rate though, so the acid isn’t going to wait for you to return back to normal speed. The levels will also try to kill you with multiple red items, such as blocks or enemies. Try not to touch them. In Slime-san, red means dead. Let’s go back to the phasing ability. It’s a clever design that lets a player navigate an otherwise difficult area with ease, while sacrificing precious seconds. It’s perfect. I can’t imagine how many times slowing things down saved my goopy behind. From epic falls into last second air hops to missing deadly razor blades by a hair, this ability prevented me from losing my mind. I absolutely loved its presence. If it wasn’t there I most likely would have cowered in a corner while the game uninstalled in the background. It was that important to me and I feel like others could agree. It’s a nice way to give newer platform gamers a fighting chance. If a level gets too hard, slow it down and see how things play out. You can up the ante by only phasing when necessary but good luck completing some of these maps without it. I definitely wouldn’t want to try it. Call it a crutch if you want but I still got my apples without dying. Speaking of apples, you can cash your fruit in at the hub for cosmetic changes like hats and screen backgrounds. In the beginning of your journey you’ll start in a hub with a variety of interesting worm dwellers. These folks will offer you all kinds of services before you embark on your adventure. You can return whenever you want to purchase new cosmetics or change out Slime-san for a different slime. New slimes have different traits like higher jumps or longer dashes. These upgrades are traded for caveats like the inability to stand still or do other important slime related movements. Choose wisely, as some levels will certainly become harder to handle. I stuck with the traditional Slime-san because life was hard enough for me. Of course, I needed some sweet panel art to adorn my screen’s flanks. If you manage to smash through all 100 levels, demolishing evil organs and hitting new hubs on the way, congratulations! You saved the day and freed yourself from the innards of a reckless rope monster. What should you do now? Of course you can return to gather every apple you missed, unlock a multitude of characters and items, and collect every piece of game art there is. Or you could try one of the other three campaigns that come with the Superslime Edition. Packed with tons of new challenges and more fruit to obtain, players can look forward to even more pixel jumping action with nearly endless replayability. Still not hard enough? Give New Game+, Speedrun, and Boss Rush modes a try. There’s sure to be a massive amount of Slime-san waiting for you to conquer. I really think Slime-san Superslime Edition is the perfect game to get your feet wet in this genre. It slowly eases you into harder and harder levels without ever making it feel like you just can’t do it. There was always a strong feeling like every challenge was achievable if you just tried to innovate with your movements. My only gripe was that the color palette was a bit hard to get into at first but that is purely personal preference. The color scheme has a certain charm to it that serves a purpose, and although I wasn’t feeling it, it helped me identify what was OK to touch and what was a no fly zone. Once I unlocked a new background and added some flavor to my screen, I felt a little more at home with my slime and things went smoothly from there. I had my doubts, but Slime-san quickly changed my mind. There’s nothing like it. I laughed, I screamed and I danced in the belly of the worm as I completed level after level. It was quite an experience, and perhaps others will feel the same triumph I felt when I finally reached my goals. This was one hell of a title, and I look forward to more Slime-san in the future.